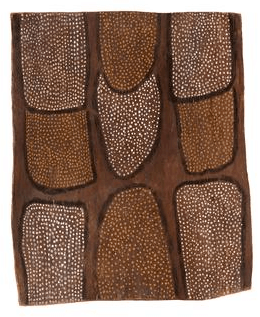 Tiwi Bark Paintings are usually rendered in an abstract often geometric style. These styles look abstract but represent ancestral lines whose meaning is clear only to the Artist. Backgrounds covered in with lines, crosshatching or dots. Stripling is also common and done with a tool unique to the area. Bark painting was originally on bark bags and then later done on square pieces of bark. The aim of this article is to help readers determine if their bark painting is a Tiwi bark painting. It gives examples and links to artists. I Buy Tiwi Bark paintings and if you have one to sell I would love to see it. If you have a Tiwi Bark Painting or Sculpture and just want to know what it is worth please feel free to send me a jpeg. I would love to see it. Many of the best Tiwi bark paintings are of Pukumani Skin designs and come from the 1960’s. They are often on stringy bark and unsupported by framing sticks. Some of the most significant early bark painters from the Tiwi islands include Ali Mungatopi and Deaf Tommy Mungatopi. Although they did some sculpture the bulk of their art was on Bark. These early bark paintings are quite rare and collectible. the best barks are of sacred skin designs and have early collection dates. Tiwi Artists decorate the surface of barks with symbolic patterns. They use kurluwukari (circles), pwanga (dots) and marlipinyini (lines). Jilamara is the name of the finished design. It literally means color or paint. The term is particularly used for body painting and Tutini decoration. The Pukumani mortuary ceremony involved a series of performances over a period of time after a person’s death. It concluded with the cutting of the burial pole tree. This burial pole was painted then erected at the grave site. All Tiwi are still expected to participate in these ceremonies. They should sing, dance and carve a Tutini (Pukumani pole) if commissioned by the deceased’s relatives. These Tutini funeral poles are the most famous Tiwi objects. Tutuni represents the body of the deceased or one of the ancestral beings. these ancestors are associated with the mortuary ritual, such as Purukupali. The following images give a good idea as to the variety of early Tiwi bark painting artists works.